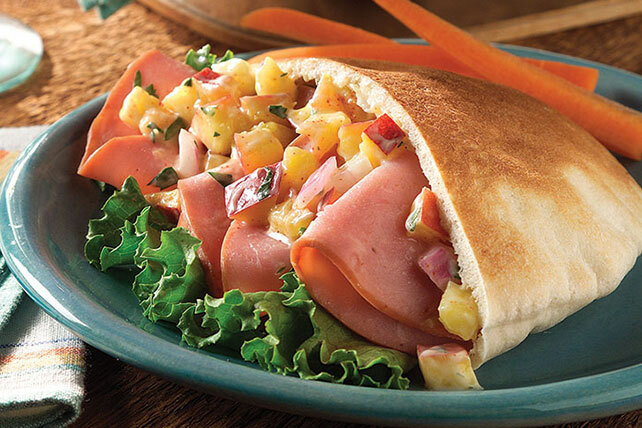 Mix the savory with the sweet in this Ham Sandwich with Nectarine Salsa recipe. Featuring onions, cilantro and dressing, you'll love the marriage between all of the flavors found in these pita pockets. You've never had nectarine salsa or a ham sandwich like this before! Place pitas in single layer on microwaveable plate. Microwave on HIGH 30 sec. Fill with lettuce, ham and nectarine salsa. For the carbohydrate-conscience diet, omit the pita breads. Prepare nectarine salsa as directed. Top each lettuce leaf with 1 ham slice. Drizzle with salsa; roll up. Reserve remaining ham slices for another use. Substitute MIRACLE WHIP FREE Dressing for the mayonnaise dressing. You're sure to savor the blend of flavors in these good-for-you pocket sandwiches. And as a bonus, the dark green lettuce provides a good source of vitamin A.